Do you know the Return on Investment on your charitable giving? Kristi Huber is the President of United Way of Cass-Clay in Fargo, ND. She is passionate about connecting people to create the biggest measurable impact for the community. Kristi has lived in the Fargo-Moorhead community since 2002 and is deeply committed to working with business and nonprofit leaders and individuals to meet the changing needs of individuals and families in the community. 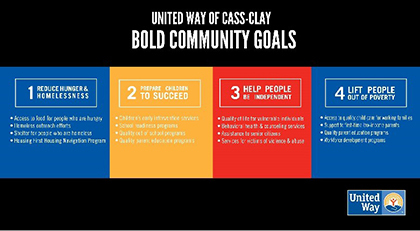 United Way of Cass-Clay connects people to people, needs to resources, and experts to advocates to improve lives throughout Cass County, North Dakota, and Clay County, Minnesota. 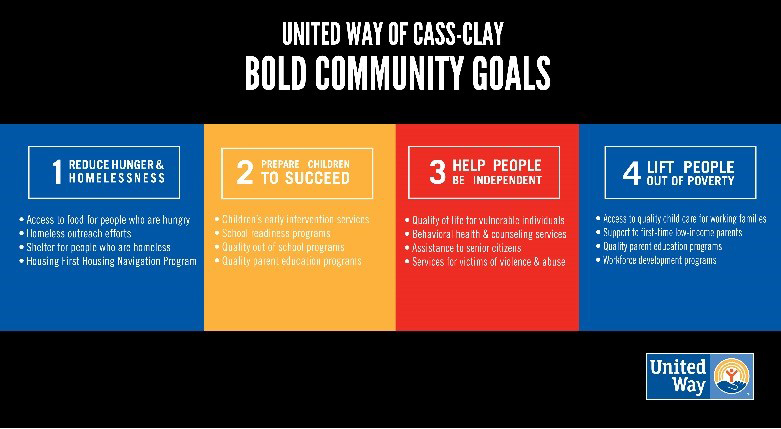 In 2017, United Way of Cass-Clay will invest $5.6 million toward achieving four Bold Community Goals. When you invest your hard-earned money with a financial advisor, you expect a return. Why should philanthropy be any different? The definition of investment is to buy something with the expectation that it will increase in value. When an individual makes a gift to United Way, they are not givers or donors, but investors. It is our job to invest their dollars into strategies that can produce results. The donors’ expectation is that there will be an increase in value for the community. As a donor, you want to invest in a non-profit that will make a significant impact on the individuals being served and the community as a whole, while also giving you a sense of personal satisfaction. If you think of this in terms of a financial investment, say a retirement account, would you make an investment without expecting to see a return? No. You expect your investments to grow and to have access to those results. United Way feels you should also expect that from any donation you make! This is why we put such a large focus on outcomes and measurements of our investments made with donors’ dollars. What is United Way’s strategy to invest dollars in the community? United Way serves the community by leveraging our investments, resources, volunteers, and corporate partnerships to deliver transformative, measurable results. In the past decade, United Way has undergone a dramatic shift in how we work to address needs in our community. We have moved away from being a historic community chest with a broad charitable mission, into a community convener that mobilizes our partners, including businesses, community leaders, public officials, residents and non-profit organizations. We use data to drive our decisions when it comes to investing in solutions that will truly “move the needle” on big community issues like hunger, homelessness, and poverty. Data and tools like ND Compass help us assess community needs and drive our investments. But, what does United Way’s work mean for our donors, and our greater community? United Way of Cass-Clay’s investment strategy is centered on four BOLD Community Goals that impact each and every one of us in this community. With these ambitious community goals, how does United Way invest dollars from the community? Each year, we evaluate programs’ client outcomes, financial stability and the overall impact on the community through a three-tier review process that incorporates volunteers at each stage in the process. Volunteers and data help to ensure dollars entrusted to United Way are leveraged to their maximum capacity. 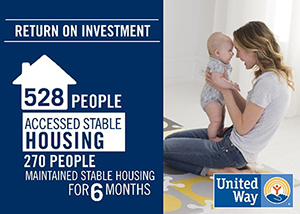 How does United Way utilize data to make investments? How do you measure success? And how often? In today’s ever-changing world, data is everything. It drives our business decisions and gives organizations the affirmation that their work is making a difference and having a return. How often does your financial advisor report back to you with the returns and results of your investments? Quarterly? Annually? What many community members may not know is that United Way Community Partners report at least twice per year on the results of their work. When United Way Community Partners receive investments from United Way, we include clear expectations regarding data and measurement for success. The United Way agrees and works hard to partner with leaders from each agency and program to determine these measurements for success. We also host a Logic Model and Successful Outcomes Measurement Course presented by Dr. Shawn Ginther, M.S.W., Ph.D., a local expert from Minnesota State University Moorhead. In return, our partners agree to report back to the United Way on these measurements and our Community Impact team is responsible for analyzing these reports to ensure compliance, effectiveness of our investments, and logically combine data (where we can) to show aggregate results of the work being done in our community. Some partner organizations may measure the amount of time their clients remain in stable housing, while other organizations may measure the developmental growth of children in areas such as cognitive language development. This is what makes the United Way different! When you make an investment with the United Way you will see a return in value added to our community. Whether that is seen through saving the community thousands of dollars in reduced social service costs by housing the hardest to house, ensuring children are ready for Kindergarten, which sets them up for long term success, or helping individuals to stay in their homes longer avoiding the high annual expenses in assisted living. We want to show our donors the results and the work being done throughout the entire Cass and Clay community, because donors deserve to see the difference their investments are making! Some may say that success is hard to measure, but when it comes to our BOLD GOALS of preparing kids to succeed and lifting people out of poverty, we know that success comes in the form of a child’s ability to recognizing letters and shapes, being developmentally on track for Kindergarten, and reading proficiency by third grade. All of these measures of success are related to one community issue: child care. Data has proven that 90% of a child’s brain is developed by age five. Local community data also suggests that lower income families have difficulty affording the cost of high quality care. 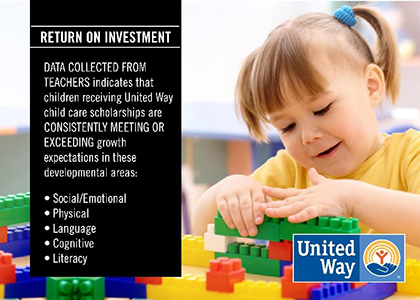 Knowing the importance of all children having access to high quality early childhood education, in 2013, United Way created an opportunity to invest in scholarships for low income families to access care at high quality child care centers. In 2017, United Way has committed to investing half a million dollars in high quality child care scholarships for local families in need. Scholarships are invested based on capacity and number of low income families served. Who is eligible for United Way Child Care Scholarships? 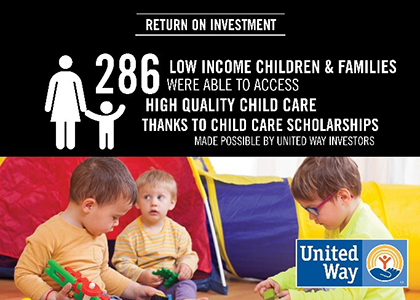 Last year, 286 low income children and families were able to access high quality child care thanks to child care scholarships made possible by United Way investors. When the right investment is made in the right strategy, there is a return on investment that impacts all of us – that is United Way’s goal. In addition to the number of children served, we are also utilizing data to measure the developmental growth of children receiving the scholarships. The data collected by these dedicated teachers and staff indicates that the children receiving the child care scholarships have consistently exceeded developmental growth expectations from fall to spring. 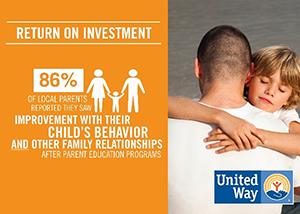 Having this data has allowed United Way to not only report back to our donors and investors about the impact their dollars have on local kids, but the data has helped us demonstrate the success of this strategy and expand our ability to offer more child care scholarships to more children. Would you like to see more data and results? For more information about Community Needs and investment results, we encourage you to view our Report to the Community here on our website. If you have questions or would like to discuss United Way’s investment strategy, please reach out to our team at unitedway@unitedwaycassclay.org or learn more at www.unitedwaycassclay.org.